The Generator Amsterdam Reception is open 24 hours a day with a duty manager always around and happy to help. It has flexible and spacious social areas, filled with creative design touches like glass-fronted elevators, a raised café and an outdoor terrace. We’ve turned the former lecture hall into an impressive chill-out lounge and bar, while the old library is now a relaxation and private events room and the basement and café are now dining destinations. Stay connected with free Wi-Fi and share those holiday snaps. In need of some clean clothes? The laundry is open 24 hours for washing, drying and ironing. A secure luggage room gives you more freedom to explore Amsterdam bag-free! The best way to explore Amsterdam is definitely by bike. Luckily for you, our hostel provides Vanmoof bikes for rental. Come to our travel shop for city tour tickets and more. You forgot your toothbrush or want a travel journal to keep track of your experiences? Visit our GenStore for exclusive Generator products. Let us help you make the most of your stay! Our hostel staff are incredibly friendly, multilingual and know the city inside out. They’re on hand to help you with whatever info you need, just ask. Ride your bicycle along café-lined waterways, visit the most creative shops around De Pijp or just kick back by the canal and try a few cold Dutch beers. It’s pretty hard to get stressed in Amsterdam, but having a good time is easy. 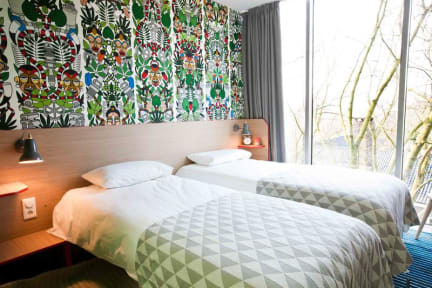 Generator Amsterdam is located in the up-and-coming eastern side of the city overlooking Oosterpark. This former zoological university building can accommodate 564 guests in 168 twin and quadruple rooms with incredible views on the surrounding and en-suite bathrooms. We’ve got a wide selection of contemporary Privates, Twins and Shared Rooms with crisp white linen and lockable storage at great rates available. If you’re in a Twin room, fluffy white towels are a complimentary extra. There is also one luxury apartment for six people with views of the park and a self-catered kitchen. Breakfast is available daily in our café space. Standard cancellation: 24 hours before arrival. Payment upon arrival by cash, credit card. This property may pre-authorize your card before arrival in case a 'free cancellation' reservation is made. Check in from 14:00PM to 04:00AM (Reception available 24 hours ) . Cancellation policy flexible rate: In case of no show or late cancellation, the total amount of the full booking will be charged unless the property is informed of late arrival by the guest. Cancellation policy non-refundable rate: In case of no show or (late) cancellation, the total amount of the full booking will be charged. Taxes not included - city tax 7.00 % per room per night. City Tax is to be paid upon check-in. The little cafe inside has great breakfast and lunch options. The location is good and the bikes available outside are nice. Biking the city was the best experience and everyone should do it. The bunk beds were so nice, clean, comfy and had a little light and charging station. The rooms all around were beautiful. My only complaint would be that the cafe appeared to have a bit of a fly problem, and you have to pay for towels (but it seems this is more typical at some hostels). Generator is a hybrid between a hotel and a hostel. The location was perfect, and I enjoyed the atmosphere there. I do think the front desk staff needs to move more quickly -- a long line of guests including myself were waiting in line for well over 45 minutes and people were visibly angry. The staff was helping one guest while people were waiting to check in, check out, etc. I was waiting to rent a bike and missed out on a good chunk of valuable sunny afternoon time. Excellent hostel. Clean and modern and in a convenient location. There's also a nice cafe and chill out areas. Would stay here again. Corporate hostel with nice amenities. Surprised to understand there is a club in the basement of the hostel with parties until 4 am on the weekends and then starting up again at 9 am so would avoid this place if you need to sleep well on the weekends. Also be prepared to bring towels, soap, shampoo etc unless you want to pay for them. Was a bit disappointed to be nickel and dimed on everything for the price we paid. I booked for two but we got seperate beds and floors. I don’t know it’s normal but it’s hard for us as we share things as well. The reason of it is it’s fully booked and can’t get us stay together. As I bought for two person, I expect to stay in one room. I think everyone is. I hope they can improve the system or something. Booked a fab little four bed private room for me and some friends. The room was very clean with good facilities. Disappointed by a lack of client kitchen as Breakfast/in house restaurant was a little overpriced and so we mostly went out. Attended the hostel recommended pub crawl which was a good laugh. Bike rental was fairly reasonable (€7.50 for half a day + a €50 deposit), but the bikes were quite small with not much saddle adjustment, so wouldn’t recommend if you’re over about 5ft9. All was fine but far too expensive on a weekend for a private room. Good facilities and security, staff were mostly friendly (except for one of the cleaners who told me to get out of one of the communal spaces). However it was incredibly expensive for what it was, and the fact that you’re banned from bringing in any food or drink makes it even more expensive. When travelling on a budget, those details become important.